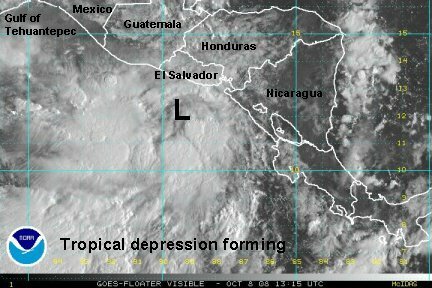 A low has been trying to organize over the past several days west of Central America. Wind shear had exposed the surface low over the past 48 hours a couple of times. The wind shear has now weakened and a tropical depression is quickly forming. Deep convection is building. Look for this too be classified soon and probably become tropical storm Odile within 24 hours. 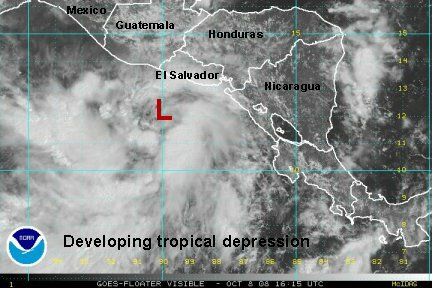 At this time the low is centered about 100 miles south of the El Salvador coast and should move wnw in the next few days. This tropical cyclone is much closer to land and may threated coastal areas of southern Mexico. Last edited by Caribbean Traveler on Thu Oct 09, 2008 9:58 am, edited 2 times in total. Satellite imagery continues to show organization with a large area of convection west of Central America. The surface low is centered about 100 miles south of Guatemala and about 100 miles wsw of El Salvador. 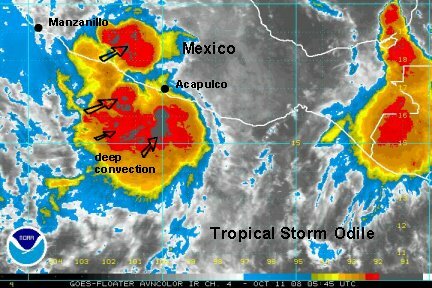 It is moving wnw and will be close to the coast of Mexico over the next few days. NHC has officially classified the disturbance tropical depression 16-E. 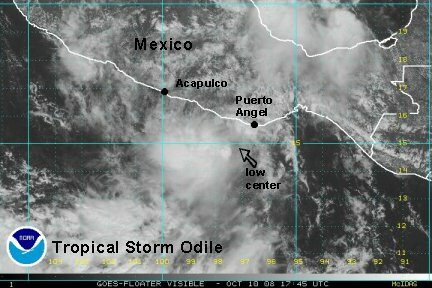 The latest satellite imagery shows that the organization of 16-E is sufficient for this tropical cyclone to be upgraded to tropical storm Odile. The National Hurricane Center will likely make the change at 2 am pdt (5 am edt). Deep convection is building over the center of circulation and a strong band is also forming to the west. 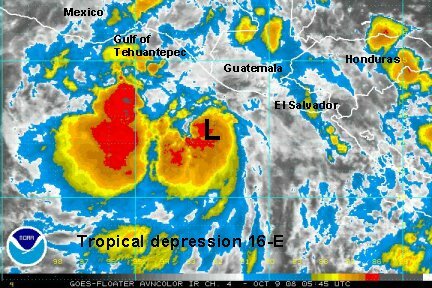 At this time the 16-E is centered 150 miles southwest of Guatemala. This tropical cyclone is much closer to land and will likely threaten coastal areas of southern Mexico. 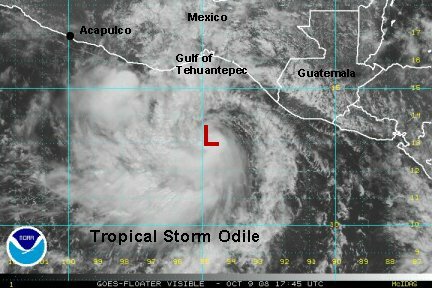 Odile continues to organize and is now officially up to 50 mph. We now agree with the National Hurricane Center on the strength of this system. The deep convection is expanding and we think conditions are favorable for further strengthening. NHC has Odile capped off at 75 mph due to the upwelling effects of Norbert before it. We agreee that since Norbert is a major hurricane, that some of these effects will be seen. It's still possible in our opinion though, that since Olile is strengthening farther southeast of Norbert's track, that is may not really "feel" this upwelling until it reaches hurricane strength. With that being said, we believe that Odile's top winds will be capped, but higher than NHC is going with. This tropical cyclone is much closer to land and will likely threaten coastal areas of southern Mexico. Look for heavy rain to move into the Mexican coast with several inches of rain possible. 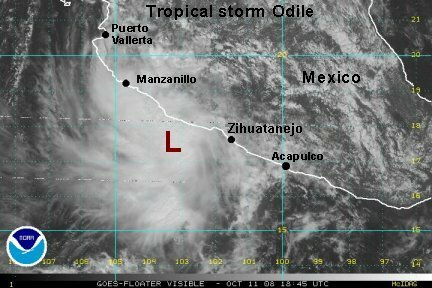 Odile is centered near 13.1 N / 94.9 W or about 210 miles southeast of Puerto Angel, Mexico at 12:30 pm pdt (3:30 pm edt). Recent microwave estimates are now in the 50 knot range. With this being the case, we'll go with a top sustained surface wind of 55 mph. 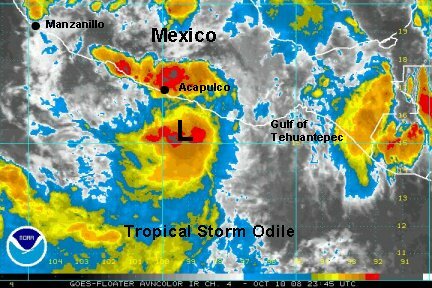 We think that Odile has the chance to become a hurricane in the next couple of days. This tropical cyclone is much closer to land and will likely threaten coastal areas of westerrn Mexico. Look for heavy rain to move into the Mexican coast with several inches of rain possible. 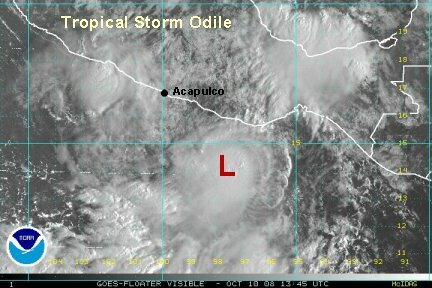 Areas of most concern will be from Acapulco northward where the forecast models keep Odile just offshore and paralleling the coast. 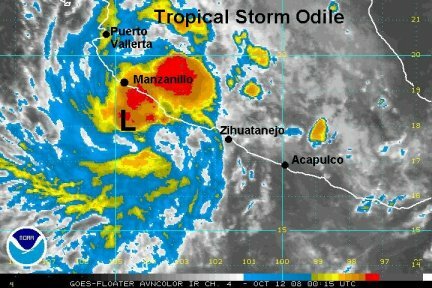 Interests along the west coast of Mexico should prepare for heavy rain, high surf and potentially strong wind gusts as Odile moves closer to the western coast of Mexico. Odile is centered near 13.4 N / 96.3 W or about 160 miles south of Puerto Angel, Mexico at 11:45 pm pdt (2:45 am edt). Recent microwave estimates are now in the 60 knot range. Deep conveciton is also bursting near the center of circulation. NHC currently has 50 mph, we'll go with top sustained winds now at 60 mph. A couple of heavy rain bursts are associated with Odile. Acapulco is now under a large thunderstorm cluster - as seen on our Tropipic. They have picked up at least 3 1/2" of rain over the past several hours. The one cluster over Acapulco last night produced over 10" of rain. The CDO near the center of circulation is growing and very heavy rain is associated with it also. NHC' s last advisory bumped winds up to 60 mph to agree with us. We think that 60-65 mph is good for now, with slight improved in the cloud structure. A high pressure center in the western Bay of Campeche has brought easterly winds over Odile. This has stripped a lot of the convection from the core of the circulation. At this point a small burst is trying to redevelop on the western edge of the circulation. Also, very deep convection remains west of the circulation. Our estimate of maximum sustained winds are now down to 50 mph. Odile may easily regain strength if the shear weakens. The center of the low is now only 70 miles offshore. If it gets much closer this will also have a deteriorating effect on Odile. Tropical storm Odile is centered near 15.7 N / 98.7 W or about 80 miles southeast of Acaculco. Acapulco is reporting light rain again, but only calm winds. NHC still has the winds at 60 mph. We think that the winds have strengthened some from our previous estimate and are near 55 mph. At this point heavy rain is the main concern. A deep cluster is offshore south of Acapulco and another near and northwest of them. Several inches of rain is possible and flash flooding and mudslides are a concern. This tropical cyclone is much closer to land and will likely threaten coastal areas of westerrn Mexico. Look for heavy rain to move into the Mexican coast with several inches of rain possible. Areas of most concern will be from Acapulco northward where the forecast models keep Odile just offshore and paralleling the coast then a turn out to sea in a few days. I.R. satellite imagery show that a huge burst of convection is building over tropical storm Odile. With that being the case, we are upping the winds to 60 mph. Acapulco was reporting light winds and an easterly wind at 23 mph last hour with Odile about 50 miles to the south. 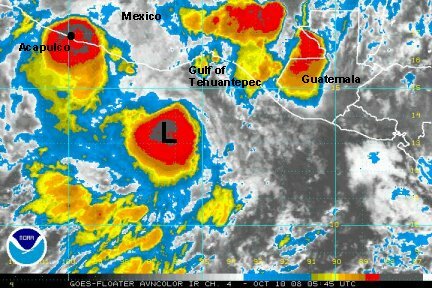 This tropical cyclone is moving close to land and is threatening coastal areas of western Mexico. Look for heavy rain to move along the Mexican coast with several inches of rain possible. Areas of most concern will be from Acapulco northward where the forecast models keep Odile just offshore and paralleling the coast then turning out to sea in a few days. 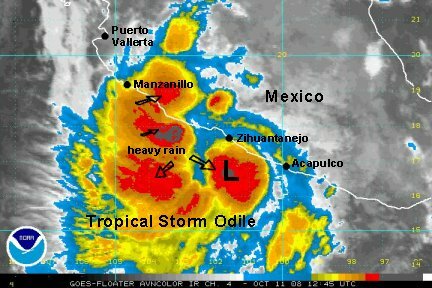 Interests along the west coast of Mexico should prepare for heavy rain, high surf and potentially strong wind gusts as Odile moves along the western coast of Mexico. Satellite still shows the convection associated with Odile increasing. This is allowing for some strengthening an we estimate winds are at 65 mph. 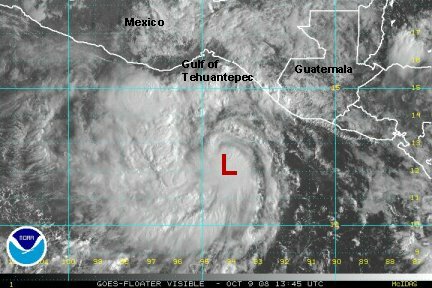 The low is centered at 16.5 N / 101.5 W or about 70 miles south of Zihuantanejo. Most of the very heavy rain is offshore, except for one cluster moving northwest near Manzanillo. Be cautious for flash flooding and mudslides. 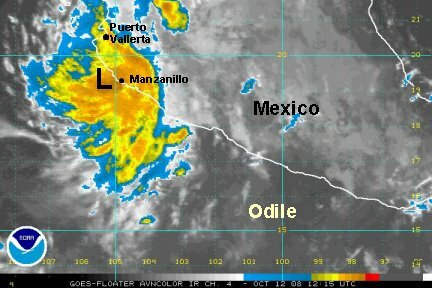 Tropical storm Odile is about 50 miles offshore near 17 N / 103 W. It is roughly halfway inbetween Manzanill and Zihuatanejo. Heavy rain bursts can still be expected near the western coast as it gradually turns more nw or west over the next couple of days. The satellite presentation is looking more organized so we think the top sustained winds are 65-70 mph. Odile's satellite presentation has become more disorganized since our last update. Cloud tops have warmed considerably. Heavy rain is still present near Manzanillo though. We are estimating that the top sustained surface winds are 45 mph. The satellite presentation of Odile remains poor. It is tough to discern where the circulation center is located. Manzanillo is reporting a wsw wind which suggests that the surface low is wnw of them. It appears that the surface low may not be colocated with the mid-level low though. This is a definite sign of disorganization. In fact Odile may not be a tropical storm any longer. We'll be generous and say that Odile is 40 mph. It is located near the Mexican coast wnw of Manzanillo. Despite being disorganized, Odile may still bring very heavy rain and cause flash flooding and mudslides. The heaviest rain is near Manzanillo to Puerto Vallerta.